Thank you! 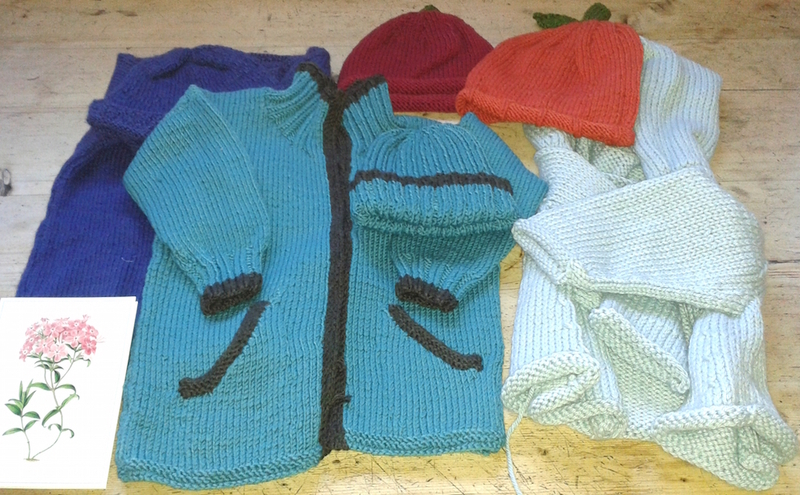 First and foremost thank you all for your generous donations of both money and wool and knitting. We successfully reached our target before Christmas and the first consignment of wool and haberdashery was sent off, and a second consignment due to go. 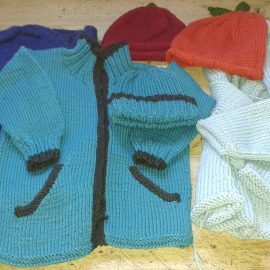 We also continue to send warm clothes, blankets and toys to refugee camps in both Kurdistan and Lesbos (as well as to refugee centres and support organisations here in the UK). One knitted or crocheted item that is particularly useful – but also something we get fewer of – is long, wide scarves. These can be used by men and women – if they are long and wide they can be wrapped over the head as well as round the neck. 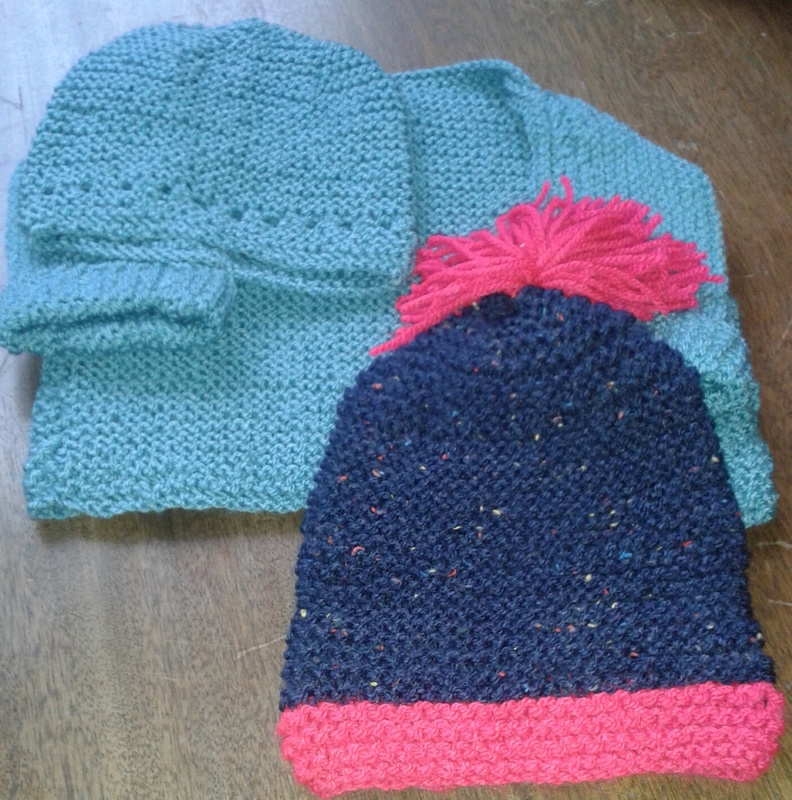 We are also keen to have haberdashery to send out with the yarn and needles for the knitting group. Basic knitter’s sewing kit of scissors, darning needles, pins, stitch holders etc will be useful as well as ‘notions’ – buttons, braid, fastenings etc. 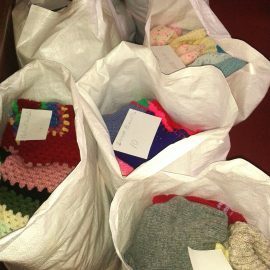 Knit for Peace has been sending Twiddlemuffs to Hospitals in Birmingham, London, Leeds, Solihull, Portsmouth, Hull and Bolton. We have had the following feedback from Andy Lee at Bolton NHS Foundation. “Here at Bolton NHS Foundation we have found the Twiddlemuffs Knit for Peace has supplied incredibly useful. 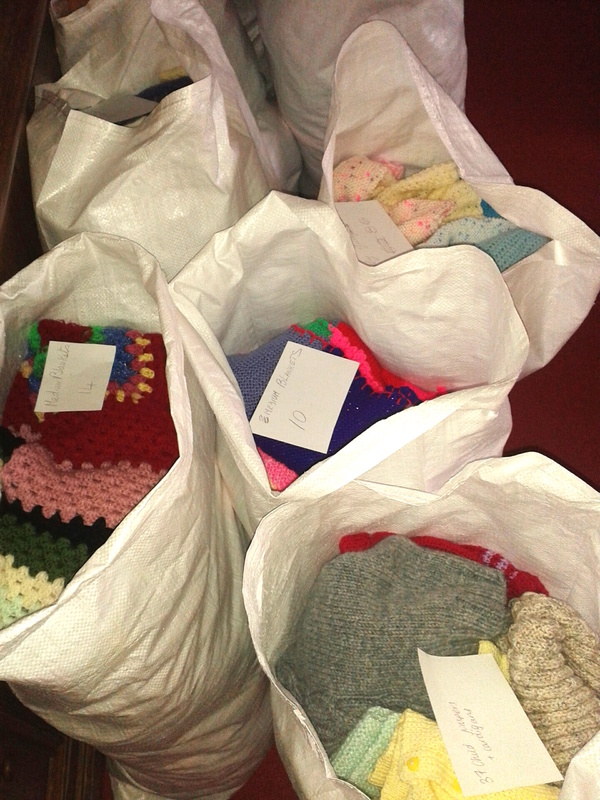 As you know it started with Twiddlemuffs for our dementia patients. The Twiddlemuffs have helped to reduce the number of aggressive incidents on our wards as patients living with dementia can become very aggressive when they feel scared or unsure of their surroundings. 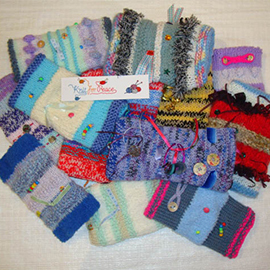 The Twiddlemuffs help to calm patients and concentrate their mind on something more comforting. The Twiddlemuffs are now being used on all our adult wards and across the hospital. The staff in our High Dependency Unit are using the muffs to stop patients pulling at lines and monitoring wires. Now one of our staff in the Theatre Recovery Suite asked if they could have some of the Twiddlemuffs to give to patients who are coming round from an anaesthetic. They have found that this stops patients from pulling at lines or monitoring pads as they come round. Due to infection control regulations, Twiddlemuffs can’t be used by more than one person and so we give the muffs to a patient as a gift and when they leave hospital they take it with them, which means we are in need of a constant supply of them. So far to date we have given out over 1,500 Twiddlemuffs both in the hospital and in the community through our community teams. I have to say that I have been totally amazed by the difference a small knitted muff can make to the life of someone living with Dementia”. With demand for Twiddlemuffs spreading, if each hospital needs about 1,000+ per year, we’re going to need an awful lot of Twiddlemuffs! Twiddlemuffs are easy to knit and can be made with bits and bobs of wool – they are a perfect first project for a beginner knitter – any mistakes can be covered with a twiddle! 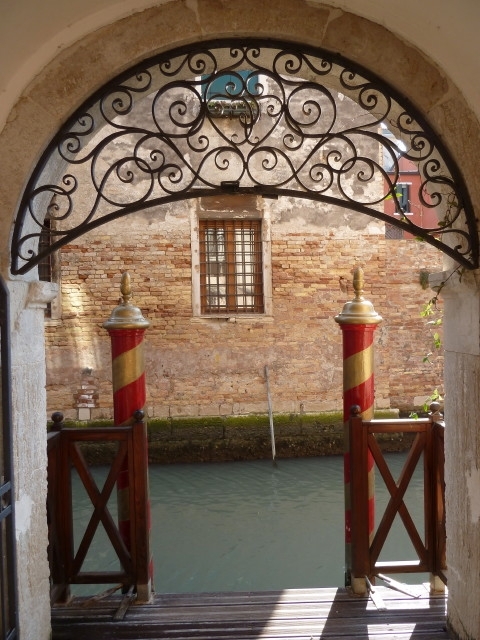 Join us for a Friends of Knit for Peace knitting retreat to Venice. 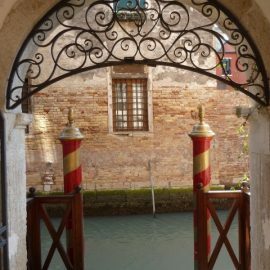 We have managed to book the wonderful Hotel Locanda San Barnaba in July 2017 for 4 nights. The Hotel is wonderfully well positioned, in the Dosodouro district, which isn’t too tripperish, very near to vaporetto stops, and within walking distance of all the great sights. We’ll be knitting in the salon and the garden terrace. The Hotel is air conditioned. The e-book with all the squares is now available for a donation of £6 and can be obtained from the website here. Many of you will recall helping us with some research into the health benefits of knitting by filling out a survey last year. We are now preparing the final report and will be launching it on 30th March. As part of the preparation for the report I read through batches of recording sheets looking at all the lovely messages you send us. They are so valuable to us! Not just in being able to demonstrate to funders and politicians the importance of knitting and crochet, but also because they give us such a boost to carry on doing what we do! These wonderful things on the right came from Nina – who will be 100 this year! Our 2017 workshop schedule will be announced shortly (here in the newsletter and on the blog).